The launch was planned around 9.30 am, but the favourable weather gave the liberty to ISRO officials to advance it. CHENNAI: Marking an important milestone in the history of Indian space programme, Indian Space Research Organisation (ISRO) on Monday successfully flight tested the country’s first technology demonstrator Reusable Launch Vehicle (RLV-TD), an aeroplane-like winged body measuring 6.5 metres and weighing 1.75 ton and operating at hypersonic speed. 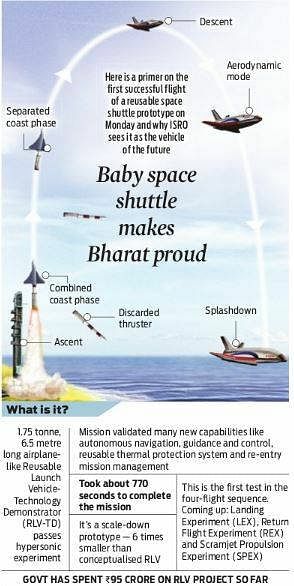 Dubbed as ‘Make in India’ space shuttle that has potential to rewrite the balance sheets of ISRO by reducing the cost of access to space by one-tenth of its current value, the experimental RLV flight lifted-off from the First Launch Pad at Satish Dhawan Space Centre (SDSC) Sriharikota at 7 am and the mission lasted about 770 seconds before it was declared “accomplished”. Initially, the launch was planned around 9.30 am, but the favourable weather conditions gave the liberty to ISRO officials to advance the launch by a few hours, which caught several amateur photographers by surprise. P Kunhikrishnan, director, SDSC-SHAR, said the launch was planned between 7 am and 11 am. “We wanted the wind velocity to be as low as possible at the time of lift-off. We found the conditions to be favourable at 7 am and proceeded with the mission.” After a successful flight of 91.1 seconds, RLV-TD separated from HS9 solid rocket booster that was carrying the vehicle at an altitude of about 56 km and the winged body ascended a height of about 65 km. Having touched the targeted height, the RLV-TD began the descent phase followed by atmospheric re-entry clocking Mach 5 (five times the speed of sound). The vehicle’s Navigation, Guidance and Control system accurately steered it along the trajectory for safe descent. It survived high temperatures with the help of its Thermal Protection System. RLV-TD successfully made a splashdown at the designated landing spot over Bay of Bengal, at a distance of about 440km from Sriharikota coast. Two ships, including Indian coast guard ship and another belonging to Chennai-based National Institute of Ocean Technology (NIOT), were stationed 25 km away from the splashdown spot tracking the signal from the vehicle and taking wind measurements. This helped ISRO officials to successfully track the flight from the ground stations at Sriharikota. Sources told the Express that a coast guard helicopter which was employed by the ISRO located the RLV-TD floating in the sea around 20 minutes after the splashdown. The coast guard reportedly took the pictures and sources said the vehicle didn’t suffer major damage as against the popular view that the winged body will disintegrate at the point of touchdown. “It would have been recovered, if planned. Since the mission didn’t involve recovery as one of the objectives, the vehicle will die the natural death. We were told by coast guard personnel onboard the helicopter that the RLV-TD was in one piece and floating. They also informed that there were strong tides threatening to drown it,” a senior ISRO official told Express. Terming the experimental launch a ‘significant development’, ISRO chairman AS Kiran Kumar said it has demonstrated and validated many new capabilities like autonomous navigation, guidance and control, reusable thermal protection system and re-entry mission management. “A wing body reaching this kind of Mach numbers, withstanding high temperatures and aero dynamics speaks volumes about our design and control. The fact that we have been able to demonstrate it in our first attempt is tremendous. 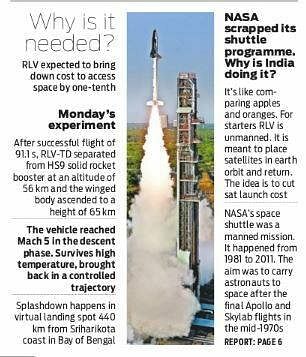 We are happy and will concentrate on what needs to be done to achieve our ultimate goal of building full-fledged RLV capable of launching satellites into orbit around earth and then re-enter the atmosphere,” Kiran Kumar said.